In contrast to excavated and preserved Cultural Heritage Sites in the open Landscape, City -Archaeology faces the difficulty to mediate to the public about the archaeological remains due to the absence of cohesive information given by the destructive nature of urban settlement activity causing the remains to stay indiscernible. Our focus in this paper is to explain the entire production process from data acquisition, Capturing and Digitization of existing remains, pre and post -processing of captured datasets, advanced 3D modelling techniques as well as the concept of storytelling to the resulting Digital Cultural Heritage Application and its outreach. Reconstruction and dissemination of the archaeological remains of the Roman Sanctuary in Maastricht. portant and splendid collection of archaeology in the Bonnefantenmuseum of Maastricht (Titus Panhuysen 2010). The present-day Onze Lieve Vrouwe square directly adjoins the western end of the Via Belgica. In the Roman era, it was most likely occupied by half-timbered houses. However, no archaeological evidence remains, as the square was once occupied by the church of St Nicholas with its graveyard at the southern end. The Roman sanctuary was built in the first half of the 2nd century CE, and was surrounded by a wall, the temenos, with entrances to the north and west. Around 150 CE, the walled court was floored with pink Roman cement, opus signinum. The western entrance was blocked off, and a small roofed chamber was built. It measured only 2.80m x 3.00m, with a disproportionately large entrance over two meters width in the eastern wall. The northern gate was richly decorated with sculptures, and a well was added on the exterior of the northern wall. Most importantly, however, a monumental Jupiter column was erected, surrounded by a small stone enclosure. The sanctuary was in use until around 270 CE, after which it was partially demolished. A small building was erected over the foundations of ruined northern wall. In a first step the existing documentation of the former excavations of the sanctuary as well as the surrounding region was gathered, sighted and discussed to evaluate its importance and authenticity for the planned reconstruction of the sanctuary. Valuable information could also be gathered through discussions with the archaeologists in charge of the excavation of 1983 together with experts of the region coming from archaeology, geodesy and the local museums like the “Centre Céramique” about the possible interpretation of the site in its phases. The actual recent topographic maps and digital terrain models where implemented into a geographical information system (GIS) and enriched with all existing, relevant archaeological evidence like Roman finds, sites and road-systems. 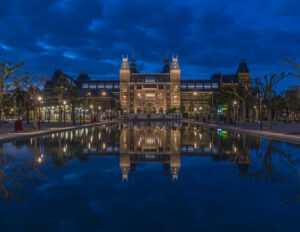 In the later this was used to sketch out the possible extensions of the city, the former waterway of the River “Maas” and served as a basis for the creation of the palaeo -terrain. Here the first task was to eliminate modern topographic features and restore lost areas of the terrain like modern quarries. 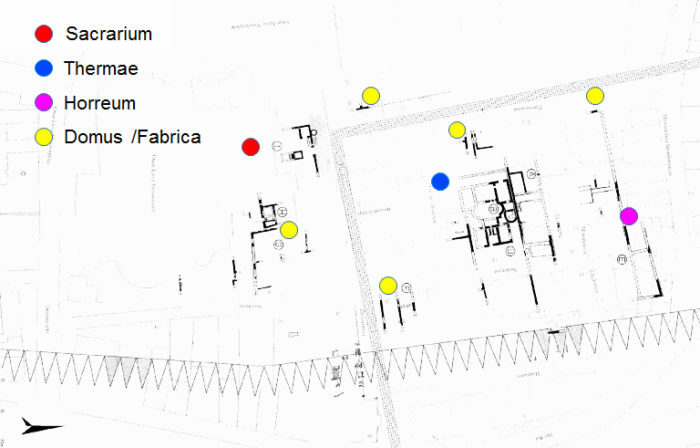 The layout of a possible Roman centuriation of the surrounded landscape of Maastricht could be approximated by using the information on known roads and farm houses (villa rusticae). Prior to the actual virtual reconstruction of the sanctuary we decided to digitize the existing remains and artifacts using a photogrammetric -SFM (structure from motion) approach. The site itself resides inside the cellar of the Hotel “Derlon” and its surrounding area is used as a breakfast room. In order to achieve the best possible lighting conditions we installed a studio like setup with indirect spotlights and started out to photograph patches of the site, using a overlap within the images of approximately 50% to ensure a good matching of features within the image pairs for the following virtual camera reconstruction (SIFT and Bundle adjustment). Approximately 900 Photos where taken and used for the processing of the different parts of the pointcloud. The herewith made junks of pointclouds where then aligned to each other to receive a single reconstruction of the existing site and use this information as a starting point for the ongoing virtual reconstruction of the sanctuary. The accuracy of the resulting pointcloud was below 7mm (average point distance ) and covered over 25 million points which where then used for the final polygonal mesh and texture creation. The same digitization technique was used to acquire models from artifacts ranging from very small statues to large stone structures of graves and inscriptions. Due to occlusions caused by the architecture of the site, not all remains where digitized. The anasylosis of missing parts was partially carried out manually by interpolation of visible surfaces and their features, while documenting the changes made within a internet blog site where all members of the project had access with the possibility to comment and evaluate the re-constructional process. 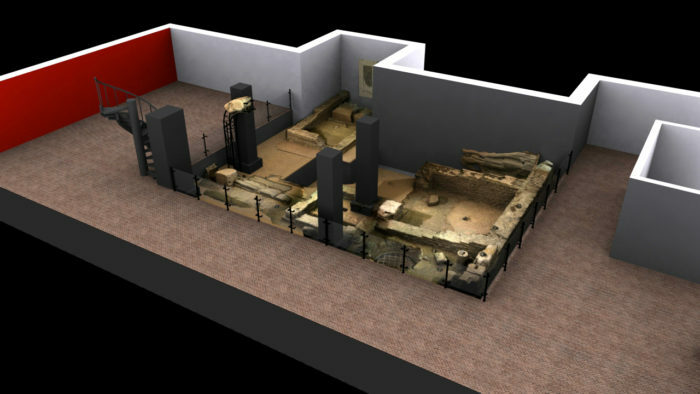 The 3D modeling process for the reconstruction of the sanctuary and its environment was based on the existing interpretations and visualizations of archaeologists involved with the site over the years as well as a expert group which met in Maastricht to evaluate this data and propose new possible interpretations to the visual appearance of the site. At first simple volumetric models where presented to communicate the idea of dimension and placement of architectural features in order to refine and correct these 3D sketches until a overall satisfactory result was achieved. A special focus had been set to the visualization of the giant Jupiter column where only fragments of the foundation, basement and its decoration where found. Following the recommendations of the sites excavator, Titus Panhuysen, in comparison with other better preserved monuments in the Rhine -land region, a quite good idea of the columns appearance cold be made. The actual modeling process was carried out in a so called 3d -voxel environment, where not only surfaces or solids can be modeled but also internal structures are involved by setting up a three dimensional grid within the editors program allowing to sculpt the geometry almost like in a physical environment. The resulting model is far more detailed then using conventional modeling methods but results in a huge file size which had to be reduced by creating a new mesh -topology on top of it, thus using the geometric information of the high polygonal model to transfer these to the lower one through the material properties of it (texture & normal map baking). A similar process was also carried out to make the high density meshes of the digitized artifacts usable for a 3d -real-time environment on mobile devices. A typology of common houses in the region was established by comparison of better preserved sites and used to set up a library of architectural parts which had been reused to create the urban settlement and its surrounding area. The information of finds was used to determine the extensions of the settlements along the known roads as well as the farms around it as well as the known graveyards, which had been reconstructed in a similar way. 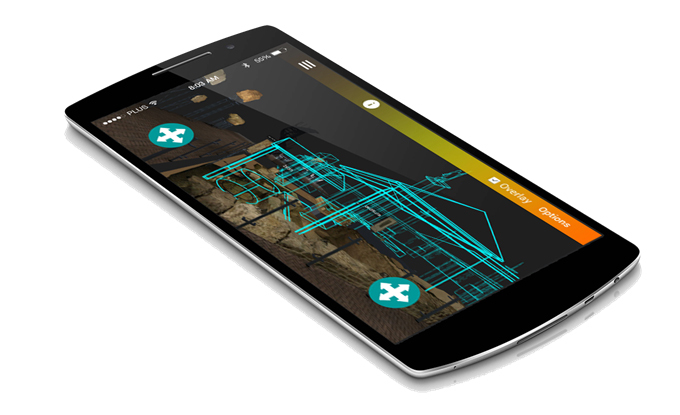 As agreed at the beginning of the project the mobile application intends to inform and introduce to the roman remains of Maastricht to a broader public by using state of the art media technologies while retaining a wide accessibility in terms of availability and user experience as well as a personalized experience by offering different levels of information according to his interest and understanding. Text, Audio, video in conjunction with realtime 3d graphics deliver the content either by user steered navigation or GPS triggered input. The challenge was to prepare the content in such a way that it could be played and executed by the majority of the available mobile hardware devices still keeping a acceptable file size for download. The first slide of the application gives a introduction to its usage and intention and allows the user to play a video where the essential of the Roman history of the region (belgica) and Maastricht is explained by the local city archaeologist and then follows on to a overview map where relevant finds can be displayed. Some of these finds are highlighted and can provide more information by simply clicking on them while offering a topographic guidance to the location on the map. 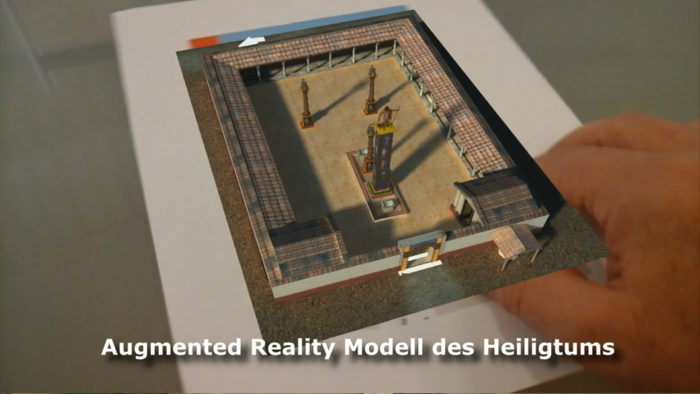 Several scenes present the results of the reconstructions or digitized items and monuments with 3d realtime techniques such as walkthoughs, gyroscope steered panoramas or augmented reality accompanied by written or spoken word. The challenge of content preparation was to present the scaled down models and scenes in a best possible quality and produce a description of its meaning in historical context for a broad audience. In all 17 scenes with more that 60 media files and over 200 models where developed and implemented. The authenticity of the reconstruction are preserved through the presentation of the original artifacts and monuments which underlie the reconstructed one and can switched on and off for comparison. Throughout the creation process, beta testing had been carried out to test the technical suitability and ensure that the storytelling and presentation of the content meets with the target audience. The final release is be available for free through the common distribution channels like app store or google playstore. After creating a framework for the dissemination of historic or archaeological content for mobile applications we are looking forward to reuse and refine the implemented technology by extending the content within this or other periods and by this, keeping the attention and interest of the user alive in respect to the costumers impact and critics. Since technology is moving onwards in a rapid speed we also want to keep track of new implementations like immersive virtual reality (VR Headsets, 360° Video or Google Cardboard) and other mixed media technologies. ¹ Beleidsmedewerker Archeologie, Team Ontwerp, Gemeente Maastricht, Netherlands.² 7Reasons Medien GmbH, Austria.³ Technische Universität Wien, Austria. -Internal and external actors involved in this phase (e.g. Board of Directors, cultural managers, operational managers, project managers and coordinators, curators, technology experts and administrators, marketing experts or departments, media and social media experts, financial departments). -Overall objectives for cultural assets, exhibition, institution, audiences. –Technologies to be used: stability, robustness, innovation. -Commercial and operational planning adaptation. Mobile application for IOS & Android, IVR & Augmented reality implementation, robust setup for G4 devices and above, adaptive content framework for future implementations, dissimenation actavities carried out by the city of Maastricht and the tourist office. –Income management and provisions for design, study & planning. –Detailed implementation and development process: technology, time frame, resources, collaborations, etc. -Verification of achievement of a full operational level, as foreseen in the design, following testing, pilot operation, adjustment and acceptance, before mass launching. -Selection of the operational personnel, training and implementation of the operational structure before the completion of the project implementation. 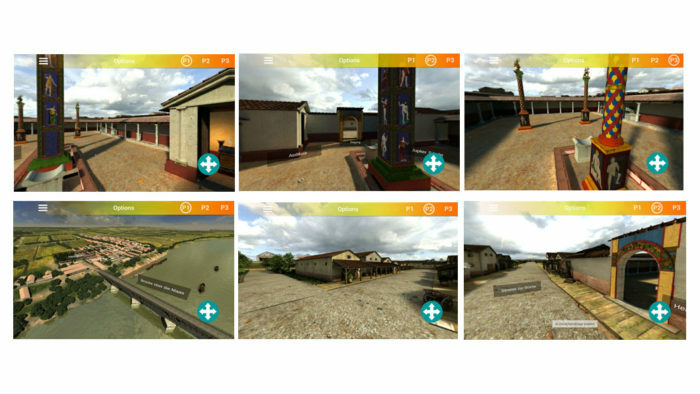 -Risk management and alternatives Technology involved: Mobile Application for IOS & Android with 3d Realitme Scenes, Augmented Reality & IVR (Immersive reality) included. 2 Month of debugging and pre release to choosen texter groups, final version was published 14 month after contract assignment. Several updates where implemented after the first publication. –Income management and provisions for development and implementation. -Income/expenses balance follow up. The pre-given Budget was split according to the financial plan and respected. –Technical decisions and quality control. -Changes due to deviations, failures, technology changes, lack of knowhow, to be examined and approved. 2 Month of debugging and pre release to choosen texter groups, final version was published 14 month after contract assignment. Several updates where implemented after the first publication. -Maintenance: issues arisen, hardware & software updates, operational and maintenance personnel, risk management and alternatives. -Operational monitoring: personnel, resources involved. 2 Month of debugging and pre release to choosen texter groups, final version was published 14 month after contract assignment. Several updates where implemented after the first publication. –Income management and provisions for operation & maintenance. -Income/expenses balance follow up. The pregiven Budget was split according to the financial plan and respected. Technologies –Measures, tools and personnel devoted to prove the direct and indirect economic and social impact and transform it into financial return, etc. Summary of downloaded applications and personal feedback of the users were used to steer the updates, technolgical updated were made in the course of the availabilty of new technology.